Monsoon in China has triggered flash floods, tearing through a southwestern China province. In its course, it has already killed 19 people, and 31 went missing. The government reported on Tuesday. The Monday night of the mountainous region of Guizhou province witnessed heavy downpours and it lasted for four hours. 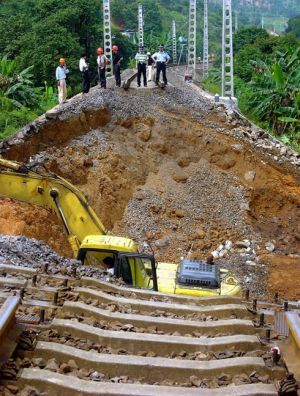 The rains resulted in flash floods, washing several houses away, according to the official Xinhua News Agency. The Agency report says that the floods forced many residents of Guizhou’s Wangmo county and Qianxi’nan Bouyei and Miao Autonomous prefecture to flee their homes. To direct the flood relief, the local disaster relief, transportation and power supply department officials have rushed to the county. To worsen the situation, the monsoon rains will move inland, down-pouring just to drench the provinces of Guizhou and Jiangxi this week. This is reported by Tuesday’s China Daily newspaper, as predicted by the central meteorological office. ← Ice age fly found alive in Scotland!